The St. Louis Gamers Blue won in a pitchers duel on Monday morning over the Indiana Prospects Blue, 2-1. St. Louis starting pitcher Criag Theiss (2017, Desoto Senior HS, MO) threw a complete game and allowed 1 run on 3 hits, while striking out 6 to win the game. Theiss showed dominating command, throwing 70% of his pitches for strikes. He also displayed his live arm that averaged a fastball velocity of 75-79 mph and topped out at 82 mph. Theiss was helped offensively by Wade Stauss (2017, :afayette Senior HS, MO), who was 2-2 and drove in 2 runs. Clean-up hitter Jacob Teichmeier (2017, Ravenna HS, NE) also had 2 hits for St. Louis and was 2-3 with a run scored. Weston Schad (2017, Westminster Christian Academy, MO) scored the other run for the Gamers Blue and finished 1-3. Indiana starting pitcher Jackson Smeltz (2018, Mccutcheon HS, IN) was equally impressive, but fell just short of winning the game. Smeltz also threw a complete game, allowing 2 runs on 7 hits and striking out 5. He maintained a fastball velocity of 80-82 mph and reached as high as 83 mph. Rhett Wintner (2017, Carmel HS, IN) provided the big hit for Indiana, slugging a home run. Winter finished 1-3 with a solo home run. Jacob Teichmeier (Ravenna, Ravenna, NE 2017) helps St. Louis Gamers Blue down Stars 2017 7-2 victory. He went 2-2 for the game with the single in the fourth and fifth innings. Adam Gast (Alexander Central, Taylorsville, NC 2017) had a hot bat for Stars 2017. He went 2-2 for the day and scored one run with a double in the second inning and singled in the fifth inning. Ben Maurer (Waterloo, Waterloo, IL 2017) looked sharp on the hill. Stars 2017 managed just three hits off of Maurer. He allowed one earned run, walked none and struck out four during his six innings of work. Derek Dyson (Alexander Central, Taylorsville, NC 2017) put together a nice outing. He gave up just one hit, allowed no earned runs, walked none and struck out one during his 2 1/3 innings of work. Elijah Moser (Bunker Hill, Claremont, NC 2018) was the game’s losing pitcher. He allowed seven runs in 3 2/3 innings, walked six and struck out two. Maurer fastball range for the day was 74-80 mph. The St. Louis Gamers Blue went on to defeat Florida Burn Navy handily 8-0. St. Louis scored in every inning except the fourth. For the Gamers, Jacob Teichmeier (2017, Ravenna, NE) went 3 for 3 with a triple and three RBIs. Wade Stauss (2017, Lafayette Sr., MO) also went a perfect 3 for 3 with a double. Weston Schad (2017, Westminster Christian Academy, MO) doubled in a run and hit a sac fly in the contest. Winning pitcher Jack Riney (2017, Lafayette Sr., MO) looked dominant in his five innings of one-hit ball. He walked three and struck out four batters. His fastball sat 74-76 mph and he topped out at 81 mph. Mitch Donofrio (2018, Venice Senior, FL) was the only Navy player to get in the hit column. Jackson Damon (2017, Lake Minneola, FL) only recorded one out in the game, but his fastball ranged from 72-76 mph. (Alec Dopp) – St. Louis Gamers Blue recorded eight runs in the first three innings of its game against Line Drive Legends at East Cobb Complex Field 3 Saturday afternoon, proving to be enough of a cushion for St. Louis to pull away with the 8-0 victory at the 2014 15u National Championship. With the win, the Gamers ran their record to 2-0-0 through the first two days of the event. Harry Hegeman (2017, Mary Institute and St. Louis Country Day HS, MO) got the start on the mound for St. Louis, and though he induced but one swing and miss, he held the Legends scoreless over his three innings of work, generating a 72.2% strike rate and 72-74 MPH fastball velocity. Weston Baker (2017, St. Louis University HS, MO) ran his fastball up to 80 MPH during his one inning of relief for the Gamers, while Tyler Ehrlich (2017, Francis Howell HS, MO), sat in the 74-76 MPH range from a high 3/4 slot with hi s heater in one inning of relief. Bryce Butler (2016, Wentzville Holt HS, MO) brought the lumber and speed for St. Louis’ offense, going 1-for-2 with a double, run scored, run batted, walk and stolen base in three plate appearances. Hegeman drew walks in each of his three trips to the plate — to go with one stolen base — while Jack Riney (2017, Lafayette Sr. HS, MO), produced a double for the Gamers, en route to a 1-for-1 batting line with two runs scored and one walk. St. Louis Gamers Blue scored in each of the last five innings of the game to claim a 10-0 victory over Cobras on Friday. Three Gamers players — Bryce Butler (2016, Wentzville Holt HS, MO), Weston Schad (2017, Westminster Christian Academy, MO), and Mark Vierling (2017, Christian Brothers College HS, MO) — each drove in two runs in the victory. Vierling led the way with three hits, falling a home run short of the cycle. Wade Strauss (2017, Lafayette Senior HS, MO) added two singles, while Jack Riney (2017, Lafayette Senior HS, MO), Bryant Thompson (2017, Clayton HS, MO), and John Bischoff (2017, Chaminade College Prep HS, MO) scored two runs, as did Vierling. Craig Theiss (2017, Desoto Senior HS, MO) earned the win for the Games, tossing five scoreless innings with just one hit allowed. Theiss struck out six hitters without surrendering a walk. A perfect sixth inning was pitched by Ben Maurer (2017, Waterloo HS, IL), and Weston Baker (2017, St. Louis University HS, MO) ended the game with a scoreless seventh. Theiss’ fastball topped out at 78 mph, and Maurer’s heater peaked at 77 mph. Baker displayed a solid fastball that reached 81 mph. The two hits for the Cobras were both recorded by Ethan Price (2017, The Westminster Schools, GA), who singled and doubled in a losing effort. The 15 Blue team and I have been on an emotional roller coaster (more of a log flume) for 3 weeks related to the challenge of Performing to your Potential. Last night, I couldn’t get the image below out of my head — so, I applied my PowerPoint skills to document my thoughts. 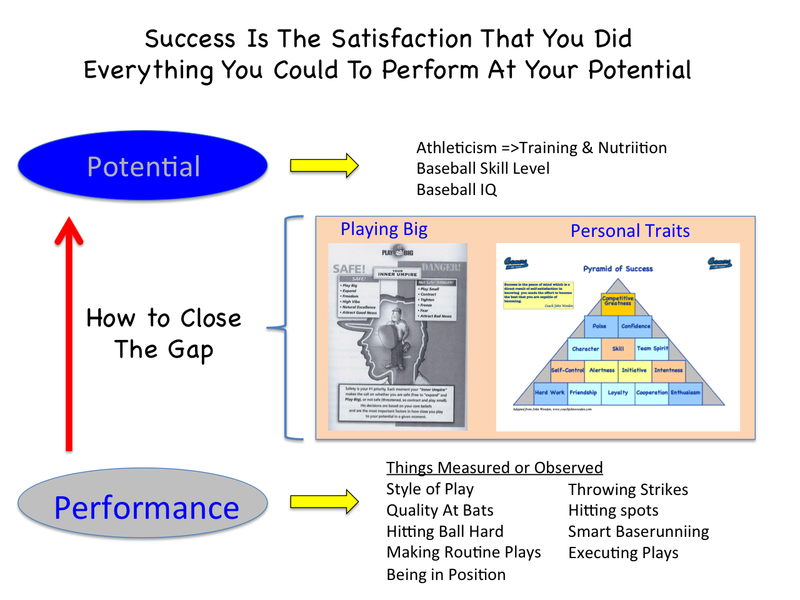 If your PERFORMANCE GAP is big, then 95% of the time you need to address issues around Playing Big and/or the Pyramid of Success. Too often, teenage boys seek the easy way out — looking for excuses, passing the blame — instead of accepting this personal responsibility. 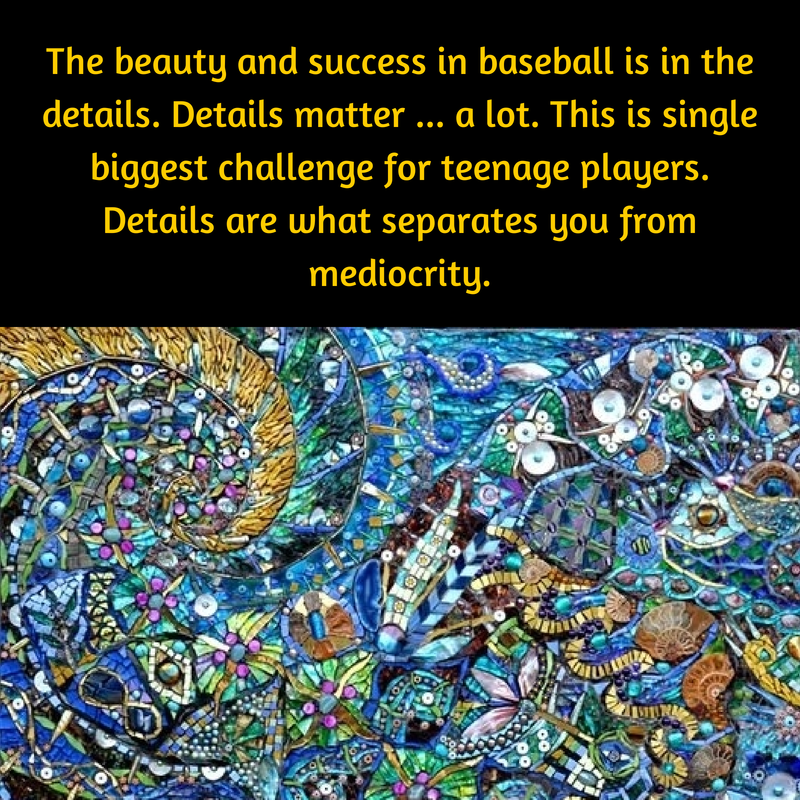 This is a very important lesson to learn and separates young men from mediocrity. But, it is not pretty to watch and is a little painful. But the end product is worth it for players who accept this responsibility.